What kind of anti-biotic junkie doesn’t like healthy fresh food? Not me. 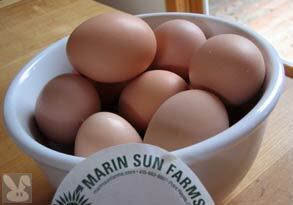 When I heard that there was a Marin based source of natural beef and eggs (chicken eggs, not beef eggs). I had to follow the cattle call. I came between slaughters when they didn’t have many items to choose from. 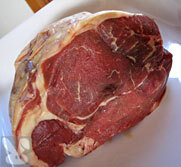 I took the staff recommendation and went with this ----roast which was only available frozen. The roast was flavorful but didn’t worship at the temple of tenderness (which I didn’t mind.) The cattle are grass fed in organic pastures, they don’t use any of that nasty cowabalistic feed that spreads bovine disease. I’m anxious to come back when they have more to choose from. The real winner are the fresh eggs. The sell them at a premium (about 50 cents each) but they are worth it. The chickens are fed good chow making their yolks a gorgeous deep orangey yellow. The whites cling to the yolks (which is an indication of freshness.) The blue and green ones are from araucana chickens which have an internal easter egg dying metabolism. I understand that they are often served with ham, in a boat, or in a car or in a plane. If you don’t want to head out to Point Reyes Station, they sell their goods at farmers markets at the Marin Civic Center, Fairfax and the San Francisco Ferry Plaza. 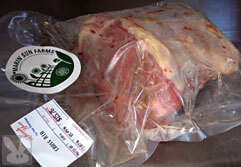 Some of the nicer Bay Area restaurants use their meats. You can get a yummy burger made from their beef at San Francisco’s Zuni Café or Sausalito’s Fish. 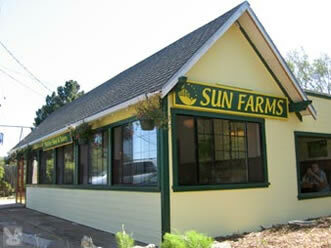 Mad Cow props to the folks at Marin Sun Farms for their natural and humane practices. 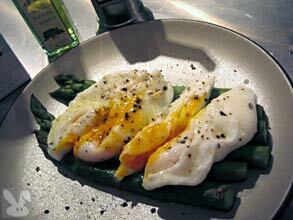 Here are some Sun Farms eggs poached over asparagus with truffle oil and pepper. The yolks break open to create a sauce for this dish.